"Sooo easy! This cookie is very malleable, and can be tailored to your families tastes. Try peanut butter, oatmeal, raisins, or chocolate chips as additions." Beat egg yolks and margarine together until well blended. Stir in vanilla. Gradually add cake mix while beating with an electric mixer. Mixture should be stiff. If it is sticky to the touch, refrigerate for 20 minutes. Form teaspoonfuls of the dough into balls, and roll in sugar. Place on ungreased cookie sheets. 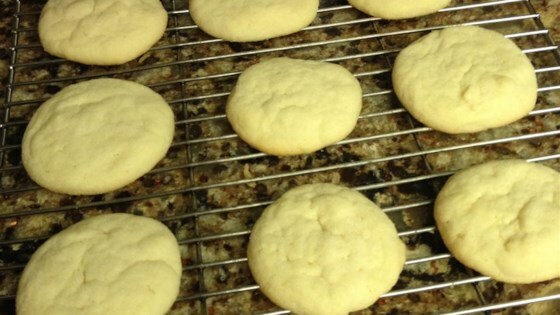 Bake at 350 degrees F (175 degrees C) for 11 minutes for soft cookies, and for 13 minutes for crispy cookies. Great recipe. I made them just as the recipe said and they were a big hit! Highly recommend these!!! This easy way of mixing cookies was great. Very crunchy!